I'm a returning player with a BS Lvl 65. Today I play for a few hours and I notice that there is not currently parties where I used/expect to level up (TF2/High Orcs?). My gear is basically a Snake Head, in that time cost me around 500k. I have never play an official server (1x1x1), so I'm struggling with my path to go. Should I go for another class in order to have something to equip my BS better? Should I attempt to sell my Snake Head because now cost more zeny? I wanted to go full agi / str , I don't know if I can compensate my lack of VIT with Flee in higher levels. I would be doing Bathory (gef dun 2) but they are super packed right now due to the amstr backpack which ends soon. Argiope card is nice and usually cheap I got mine for 40k. Which reduces Bathory damage until you get a Bathory card. Honestly going high orcs gives more exp but you don't make nearly as much money. Lack of vit means stunning monsters like high orcs will get you killed without gear and late game that will make leveling near impossible. Also, HO are mostly for mobbing and they mob excellently but as agi BS your not going to be mobbing a lot. I personally like having 10 int. It really helps with sp compared to none for me at least. I went from using WoE pots to never need it. The fewer resources you use to farm the more money you make. I can greed/teleport for hours before I need to use sp items and without 10 int I go around 20 minutes or less. I didn't think it would make a difference at first until I actually tested it and was impressed. With no sp healing cards at all. Prontera church sells rosaries that give +2 luk +5mdef or something like that for 10kish with discount.and make for good dodge/magic def on the cheap. Getting to the point where BS is profitable and playable doesn't really happen until 80. Unless you really geared heavily or going cart rev build which I've never tried. Keep the snake hat its the most OP thing in the game right now. They are selling high but so are cards and everything else you could buy with that money so you wouldn't be that far ahead. As for stats everyone says going max is just a waste. Edited by CodeJerry, 01 December 2017 - 11:03 PM. Are you planning to use Cart Revolution? Or autoattacking only? Thanks for replying! I'll definitively buy rosaries and consider 10 INT, also I tried Bathory yesterday and except for the ~1k Attack I was doing fine, so with the Argiope card that you said maybe I can stay for a large amount of time. Yeah...really I don't want to sell the snake hat, it's just so good. As for stats I don't really mean 99, but main it, so again I'll consider 10 int. Thanks for replying! 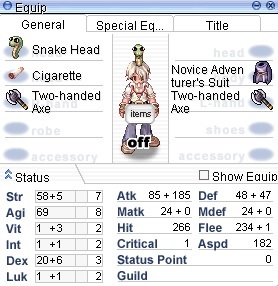 I think I'll just autoattack with the snake hat, because as I remember Cart Revolution will drain my sp faster that I can afford. Okay since you are autoattacking and won't be AoE leveling with Cart Revolution, you should give Isis a try at Morroc Pyramid. - Put either a Deviruchi card or a Myst Case card in your Snake Head - Deviruchi will make you immune to blind which will really help you out when you are AGI build and Myst Case will give you some gift boxes that you could luckily open into an OBB and sell to the market. - Fresh Fish: Sold at the Chef Assistant in Comodo (Warp to Comodo, walk right) cheaper than an Orange pot and heals more than it and it only weights 2, so you can bring 200-300 or more per leveling trip. Undershirt + Pantie is my main goal right now, although undershirt seems a little bit expensive. With that said I don't think I can afford Clips with Yoyo x2 but in case I get some zeny I'll try it. For whatever reason I didn't think on Isis, I guess because my Assassin had a bad time with them /swt . I'll try it later! About Cart Revolution, I guess I'm afraid to screw my 'hard work' with leveling my Merchant and then my stats not being good for a BS (?) I don't know honestly, I'm new to the job so I don't know the efficient way to level up. I'll consider the option. I use Meat! but I'll test Fresh Fish and see what suits me better. @iSeenUB4 What are some good Cart Revo mobbing spots beyond Poison Spores?